I agree. It’s delicious. 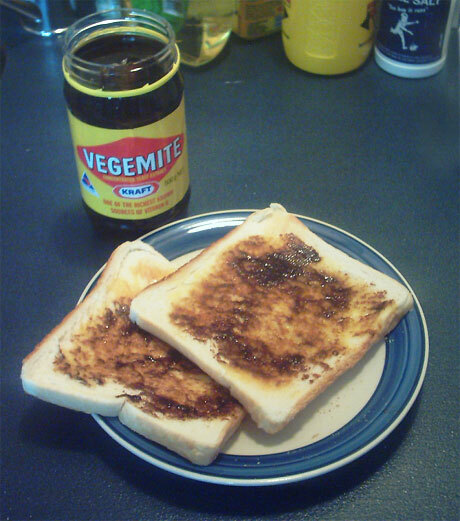 Americans have no idea how to use vegemite (or its British counterpart, Marmite) but I love it spread thinly on buttered toast and once in a while will stir it into a soup or use it to enhance a meat dish. Good stuff. Vegemite and Melted Cheese…. MMMMMM! Hi Sally, so nice to meet you at Stacey and Nick’s wedding. Thanks for your thoughts about my blog. I’ll definitely look into doing something on Chicken Fried Steak. Oh Vegemite! I love it so. And I have you and Matthew to thank for bringing it (and now that amazing commercial) into my life. Glad to hear that you’re “a happy little vegemite.” Can you buy it out there in Ohio? If not, you should pick up a jar next time you’re back here visiting us in civilization ;). That sounds tasty- I like worchestershire sauce, anchovies(I know),etc-need to get some soon!